A pot of Turkey And White Bean Chili simmering on the stove is the perfect antidote for a cold or rainy day. Made with shredded turkey, white cannellini beans and spices, this recipe will make you forget about the gloomy weather outside. This chili also has an ingredient you might not expect and that is ground tortilla chips. Not only do they add flavor, they help thicken the chili as well. Heat the olive oil in a pot over medium heat. Add the onions and peppers and cook, stirring frequently, until the onions are translucent and just starting to color. Add the garlic and cook another minute. Add the spices, stir well and cook for another minute. Add the turkey, beans and stock and mix well. Bring to a boil then reduce heat and simmer for about 30 minutes. Add the ground tortillas to help thicken the chili and simmer for about 5 more minutes or until the chili reaches the desired consistency. If the chili is too thick, thin it with a little chicken stock or water. Taste for seasoning and adjust, if necessary. Ladle the chili into bowls and serve. If you like, you can serve condiments such as diced jalapeños, sour cream, shredded cheese, chopped cilantro or tortilla chips as toppings for the chili. Tips: This is a quick and easy meal to prepare and can be adapted to your taste. I like to char poblano peppers and peel them before cooking. I find the tough outer skin difficult to digest. I char them on the open flame of my gas stove then put them in a covered bowl to steam for a few minutes. When cool enough to handle, the skin slips right off. While this step is not necessary, I find that charring adds flavor to the pepper. Chipotle and ancho chile powders are dried, ground peppers and should not to be confused with chili powder, which is a blend of ground chilies and other spices. Ancho chile powder has a moderately spicy but rich flavor. Chipotles are smoked jalapeño chiles and chipotle chile powder has a smoky, sweet, spicy flavor. The chili would be equally good substituting rotisserie chicken for the turkey. If you like tomatoes in your chili, you might add a small can of diced Rotel tomatoes, either mild or hot, depending on how hot the fresh chiles are that you use in the chili. To remove some of the heat from chile peppers, I like to take out the seeds and the veins. I suggest you uses gloves when working with chiles if you have sensitive skin and be sure to never touch you face or eyes while working with them. Wash you hands carefully after handling them. If you notice, I did not add salt to this recipe because of the chicken stock and the tortilla chips which are both salted. I taste right before serving, then add salt if needed. Lastly, you might notice I’ve used both spellings of chile and chili…it all depends on where you live. For this recipe, chile refers to the plant and its dried, ground peppers and chili refers to this recipe which is turkey and white bean chili. The turkey and white bean chili is a very flavorful recipe although it is not very hot, spice wise. You can adjust the heat of the chili making it as mild or as hot as you like by the kind of chile peppers that you decide to use. The next time you have a gloomy or cold day, think about making a pot of this comforting and healthy turkey and white bean chili. Serve it in colorful bowls and think warm and happy thoughts. This entry was posted in food, Home, lifestyle, photography, recipes and tagged chili or chile, healthy recipe, quick and easy recipe, southwestern chili, turkey and white bean chili, turkey chili, white bean chili. Bookmark the permalink. What a great idea to use tortilla chips as a thickener! Sounds great! Thank you Kay, The night I made the chili it was cold, rainy and windy and the turkey and bean chili was perfect. Looks wonderful, especially for a cold day like today! Thank you Jeanie. It sounds like you are in need of a bowl of this chili, stay warm. Your post is timely as this morning I decided to make white bean chili with left over chicken. I’ll use the chicken and modify with what is included in your recipe. Hi Linda, I’m happy that my recipe was timely. It will be delicious made with your left over chicken…enjoy! Hi Sylvia, I’m always happy to share my recipes, I’m glad you like the chili recipe. Making Carne Adovada today, but your recipe sure makes me wish I had a big pot of this simmering on the stove. It’s supposed to snow all afternoon here. Love these types of soups. Sounds delicious. Can’t wsit to try. It’s snowing here today so this sounds wonderful to me, Karen! All of the flavors sound wonderful. Next time we get a rotisserie chicken, I’d love to try it. Thank you Susan, for your compliment. A rotisserie chicken will be put to good use in this recipe…enjoy. 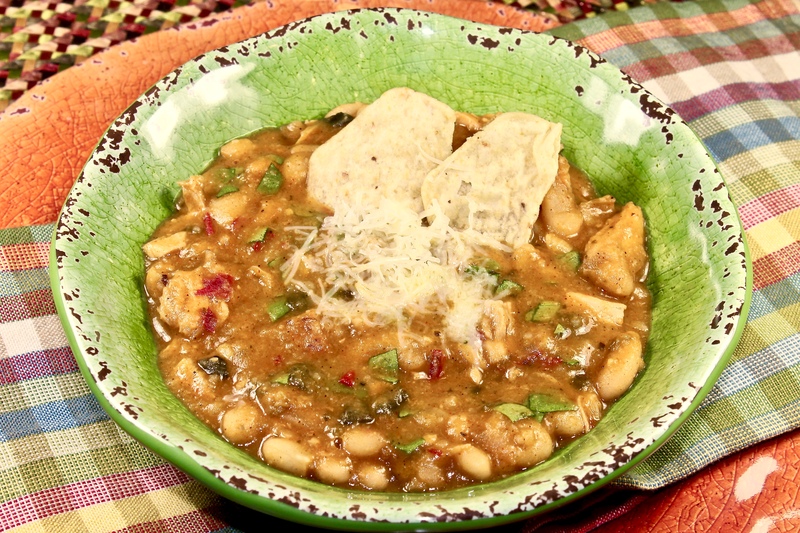 Love turkey (or chicken) chili with white beans. And plenty of chilies. This looks terrific — haven’t made chili for a while, which for us — at this time of the year — is really unusual. Like the idea of ground tortilla chips as a thickener — I’ve actually tried this, and it’s a great addition. And as you point out, a great way to add salt to the dish. Good stuff — thanks. Thank you for your compliment on the chili John. I love chili anytime of the year but especially during cooler weather. Yes, tortilla chips are a great thickener and do add to the flavor of the dish. This looks delicious, Karen. This is perfect for the cold weather we’re having right now. Thank you! That sounds absolutely heavenly, Karen. I love all the different chiles that you used in the recipe – I can only imagine the complexity of flavor! Will definitely be trying this next time we have some shredded turkey around! That’s perfect winter food. Charring and peeling the peppers definitely adds a smokey flavour – it’s very popular with red bell peppers in Spain. Thank you Ronit, It was a hearty dish and perfect for one of the days when it was colder than normal. This looks beautiful and sounds delicious! I think we’re on the same wavelength recently with dishes like this. It’s certainly the season for comfort food where I am in cold and dreary London (Canada’s London, that is). And if the sun comes out tomorrow as promised, I’ll still be craving dishes like this chili! I agree Marlene, I would like your chicken, tomato and bean dish as well. Thank you for your nice compliment and stay warm. Oh, I like the inclusion of cannellini beans in this recipe! They are my favorite and would we perfect for white turkey chili. Well done, Karen! Thank you for your compliment Judy. I think I probably use cannellini beans more often than any other bean I cook with. They went nice with the turkey in this chili. Here across the wide land masses and that big Pond one may not reach for turkey nor chillies as often as over your way. But love cannellini beans and want to learn more about the different chillies, so shall most decidedly try 🙂 ! One does not need winter – ’tis appetizing even in today’s 41C burst of heat here . . . . remember most of the hot curry eating nations have similar temperatures . . . Thank you for the pin Judy, it is much appreciated. This would definitely be a nice dish to have when you return home to New Hampshire. In the meantime, keep enjoying the warm weather. This is one of our favorite winter dishes, Karen, but I’ve never made it with shredded turkey! Always ground. I would love to try this version, and think that would quickly become a hit! Also, I often add some masa to thicken, but again, never thought of the chips! This is a fantastic way to go. I’m sure this will be on my list this week. I’ve had a bad cold and this sounds so warm and nourishing!! Hi Debra, I’m sorry to hear that you haven’t been feeling well. A bowl of this chili might not cure your cold but it would be warm and nourishing nonetheless…wish I could have shared some with you. this looks absolutely wonderful Karen! Thank you for the compliment Gloria, I’m glad you like the looks of the chili. Thank you Lisa for your compliment. I happy to know that I’ve given you some inspiration for a new meal. Thank you Eva, it is nice to have you stop by. Karen, it looks delicious and who knew about the tortilla chips, great idea! Thank you Pam and it is always nice to share little tips. I’m glad you like the one about the tortilla chips. This sounds like it would be too hot for my palate. Hi Tandy, Actually this chili is not very hot spice wise and can certainly be adjusted by the chilies you use and how much of them you use. Such a delicious, healthy and comforting dish…perfect for my lunch! Hi Angie, I can vouch about the chili making for a good lunch as I did that a couple days later and it was delicious. Thank you for your nice compliment. I like the idea of using tortilla chips to thick a sauce. And the recipe generally seems like one we would enjoy. Thank you Helen, tortilla chips are great for thinking soups and sauces…I’m glad you like the recipe. Thank you Diane, I’m glad you like the sound of the recipe. I appreciate your nice wish, I hope you had a nice week as well. Sounds like the perfect antidote to cold windy nights. That is just what I thought when I made this Penny. It was for one of our colder than normal days this winter. A delicious antidote, indeed, to a cold gloomy winter’s night. Just looking at it makes me happy. Thank you for your kind words Jo, I’m glad that this dish would make you happy. Very nice! I like the idea of the crushed chips. Sometimes in the past I’ve added finely ground cornmeal, but I like this better! Hi Mimi, I’ve used fine cornmeal as well but the chips seem to add more flavor…I’m glad you like the tip. Hi Gerlinde, Chili is such a versatile meal…there are so many ways of preparing it. I hope you will like this version if you get a chance to make it. Looks really good Karen and sounds like it has a nice bite to it. Thank you for your compliment Larry, the chili did turn out just right. Thank you Charlie, I know after all the heat you have had that you really must be looking forward to cooler weather. That is when you would enjoy a dish like this. Hi Pam, I’m glad you like the chili recipe…thank you. Yes, tortilla chips work great as a thickener. One of my favorite chilis ever was made with pork. I’ll bet this is delicious! I’m glad you like the idea of using turkey in my version of chili Inger. It makes a nice change and goes well with the white beans. Thank you. A steaming hot bowl of this Turkey and white bean chili sounds so inviting on the sunny, but very cold winter day. Hi Deb, Chili is a good meal to have when it is cold outside. I hope your weather has warmed up, ours has. Lovely recipe Karen! I’m not sure I will be able to get Pablano Chillies in Sydney and I imagine they are integral to the recipe….I will have to research it. Like so many other of your readers, I love the idea of the tortilla chips . Thank you for your nice compliment Kathryn. The spelling of chili whether the dish or the pepper depends on where you live. And speaking of where you live, I know certain ingredients can be hard to find. Poblano peppers are a mild chile with usually very little heat. An Anaheim pepper would be the best substitute but I don’t know if it would be any easier to find. I think you could use a green bell pepper and then add another jalapeño pepper for spice. I really like your take on this chilli, it’s not something that I’ve ever tried before but it’s made me so hungry! I love turkey or chicken chili, all those flavors and spices – truly a nice pot of chili, Karen, and I love your hints on handling chile peppers! Thank you Laura, for your nice compliment. I’m glad you like my version of turkey chili. I make something similar with chicken. Your recipe sounds wonderful. This looks really good! Perfect comfort food for this chilly weather. Thank you for sharing!